I hope you and your loved ones have happy holidays, a very merry Christmas (if you celebrate it), and of course do not forget to stop for reindeer! PS: It is amazing how much effort some people put into decorating for the holidays – these reindeer are at least 12 ft. tall if not taller. I am wondering where the owners store them and how they put the reindeer together. I loved the look and the fitting “edited” street sign though. 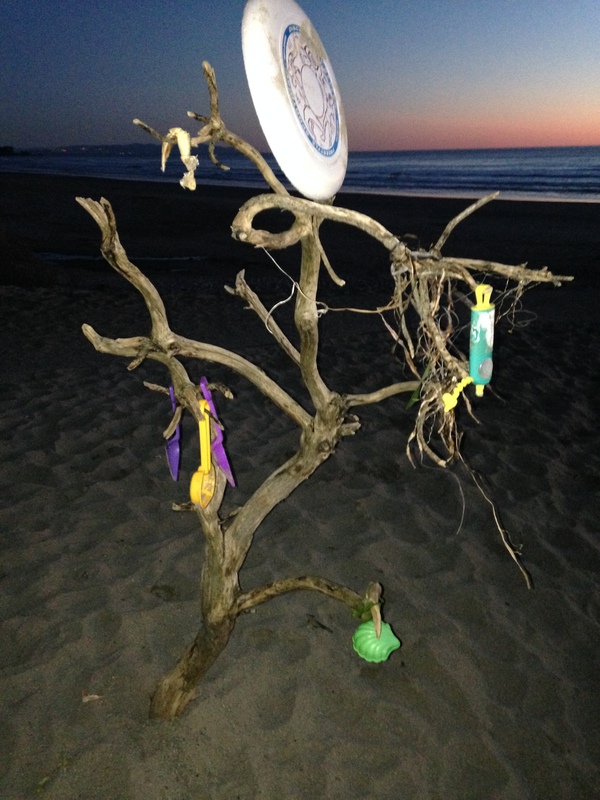 A Beach Version of a Christmas Tree: This tree on Stinson Beach was decorated with all the items/toys forgotten on the beach and ready for pick-up by old and new owners. 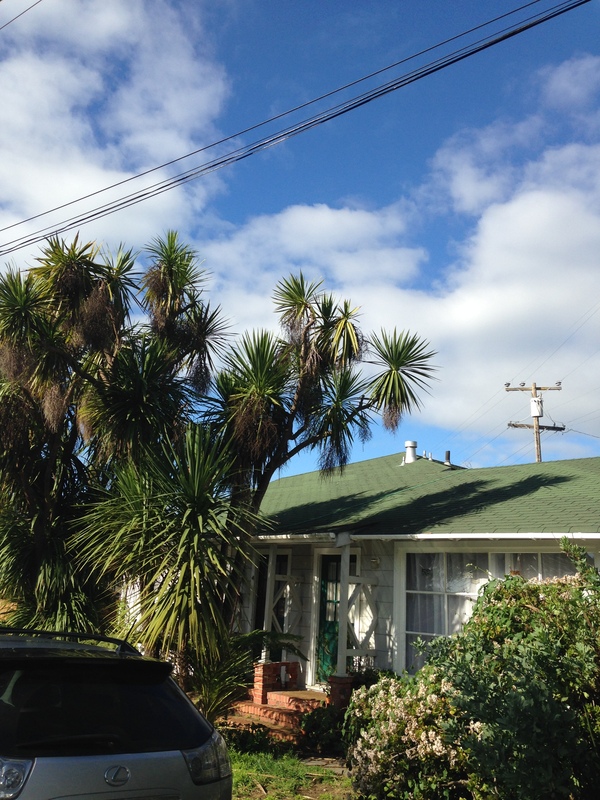 The next morning, the tree was empty – a perfect version of a Christmas tree for the beach. 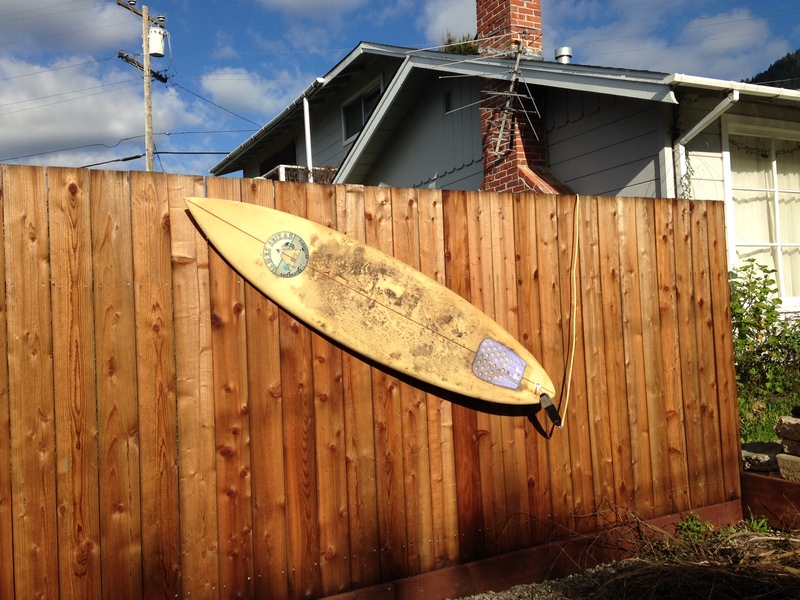 One of the advantages of living in California is the easy access to beaches and warm(ish) weather even over Christmas. Sure, beach weather is better/warmer in Southern California (and admittedly many other parts of the U.S.), but I love the beaches in Northern California. As plenty of songs indicate, Christmas or winter holidays are associated with snow and many do not get that true holiday feeling unless there is snow on the ground. This also applied to me when I was still living in Austria, but I got over that pretty quickly. Holidays without snow are just perfect for me, especially when spent on the beach. 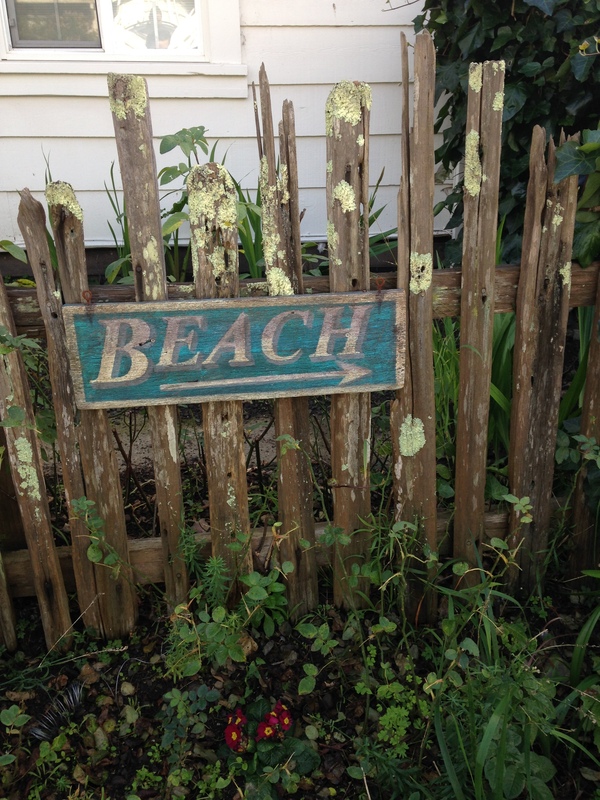 I was lucky enough to spend this year’s holidays at my favorite Northern Californian beach, Stinson Beach. It is a three-and-a-half-mile sandy beach about forty minutes north of the Golden Gate Bridge. The current population according to the town’s welcome sign is 486. 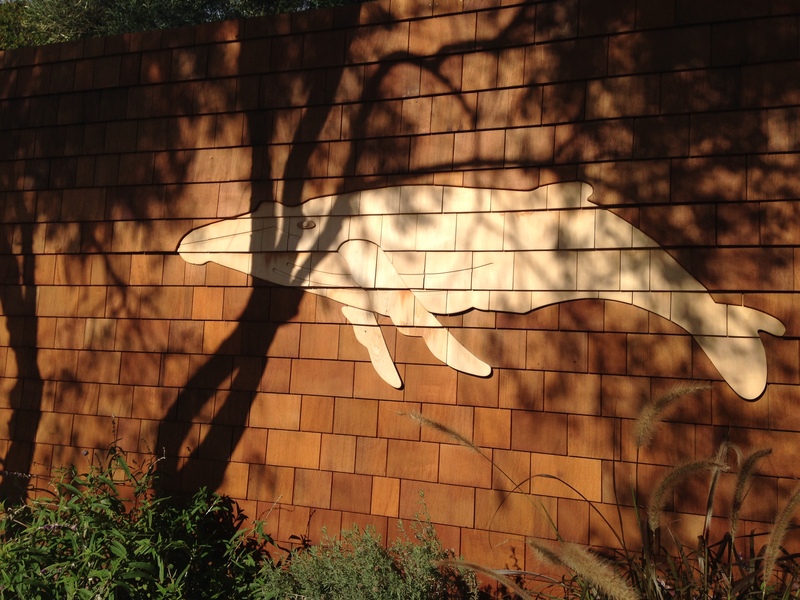 Highway 1 to Stinson Beach offers stunning vistas of the Pacific, and the road past Muir Woods and below Mt. Tamaplais leads through coastal redwood forests. On a clear day, the views on the trip to the beach as well as on the beach are breathtaking and show California from one of its best sides. 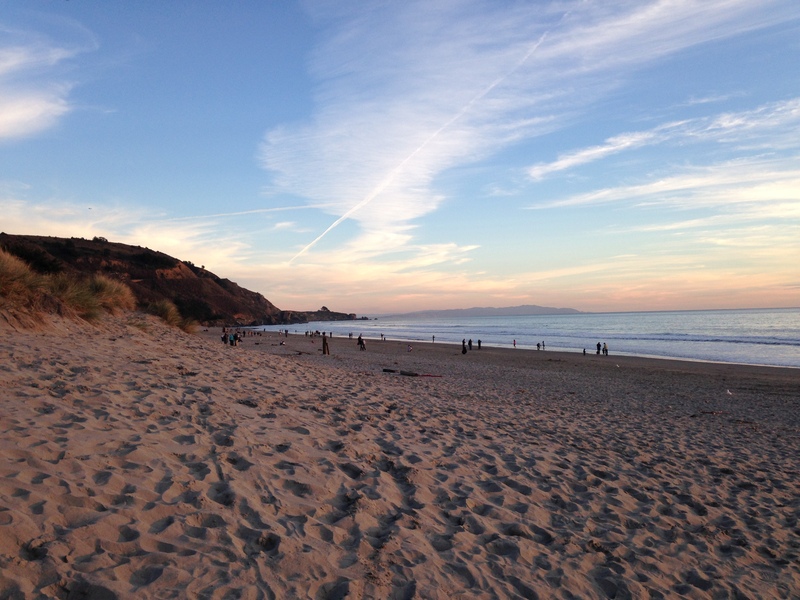 California, and especially Stinson Beach, has convinced me that winter holidays are better with a beach. December is a busy month for traditions in Austria. Krampus Day on December 5 is followed by Nikolaus Day on December 6. It is the day of St. Nikolaus, and even though the American Santa Claus is modeled after him even in name, they two do not have much in common. St. Nikolaus does bring gifts for the good kids but in the evening of December 6. He was the Bishop of Myra, which is in present-day Turkey, in the fourth century. He is the patron saint for a lot of different groups ranging from students to pirates to prostitutes. I guess he is popular for so many groups to choose him. But the “job” as patron saint for children and students is the reason for the traditions associated with December 6. And because he was a bishop, he is dressed quite differently than Santa Claus. St. Nikolaus wears the robes of a bishop and with that comes a mitre and a pastoral staff. He is usually white-haired and has a long flowing beard but he is usually not chubby like Santa Claus. 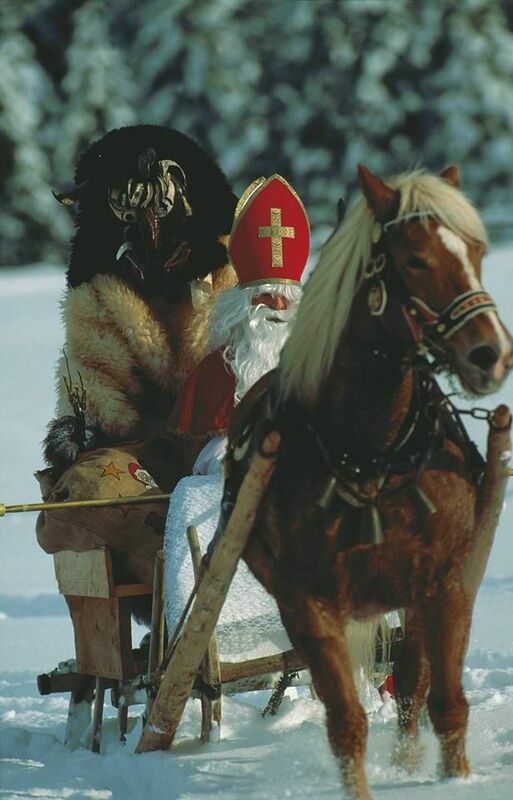 St. Nikolaus also does not use a flying sleigh with reindeer but walks or rides a horse or a “regular” sleigh. He also does not come through the chimney in the middle of the night, but politely knocks on the door. 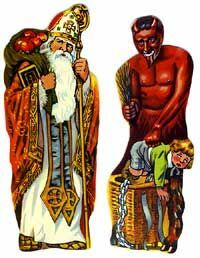 St. Nikolaus usually is accompanied by Krampus, a demon-like beast to scare the naughty children (see yesterday’s post). Nikolaus usually asks the parents if the children have been good, and if the answer is yes, Krampus is asked to wait outside the door where he hollers and rattles his chains to warn children to behave all year. Once Krampus is banished, Nikolaus usually asks the children to recite a poem or sing a carol for him before he takes gifts out of his large bag. Since he is really carrying the bag and the gifts, the gifts are usually chocolate, apples, oranges, and possibly books or other small items. To remind children again that Krampus is always watching, a small bundle of birch twigs is included in the gift as well (see yesterday’s post about the birch twigs). If the parents did not rent a Nikolaus to come to the house, children still receive gifts though. Little bags or shoes are left by the door and are filled with the gifts once it is evening. 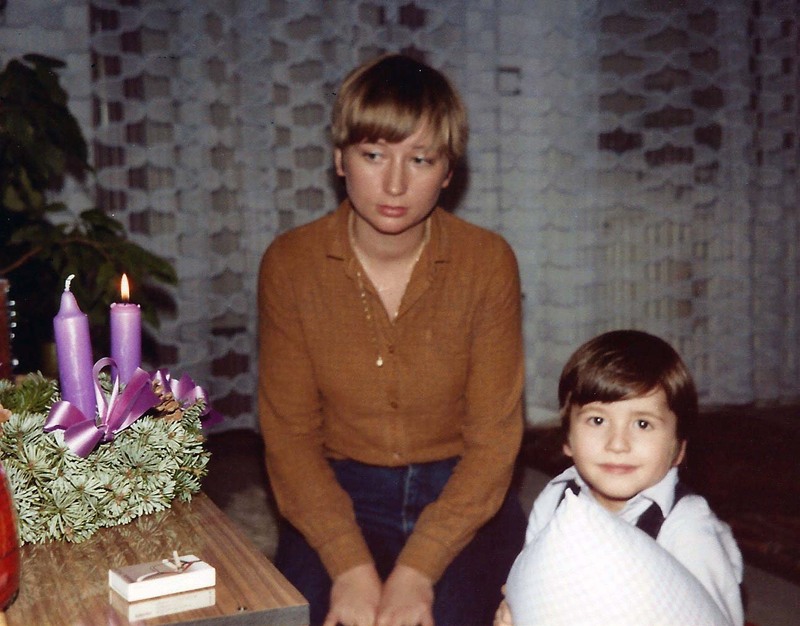 The few years when Nikolaus did not come to our house, my mom would ask us into the kitchen and close the door behind us. We would hear the rattling of chains outside the door and my father’s voice as he was supposedly addressing Krampus to tell him that only good kids were living here. My brother and I stood by the door and were straining to hear every word and hoping that Krampus would not be allowed into the kitchen. A few minutes later, we were allowed to leave the kitchen, and lo and behold, there were gifts in our boots! Even though children receive small gifts on December 6, they will receive more gifts on Christmas, which is celebrated in the evening of December 24. But there is no confusion between St. Nikolaus and Santa Claus in case you are wondering because we do not have Santa Claus. Christmas gifts are brought by the Christkind in Austria (literally: Christ Child), an angel. 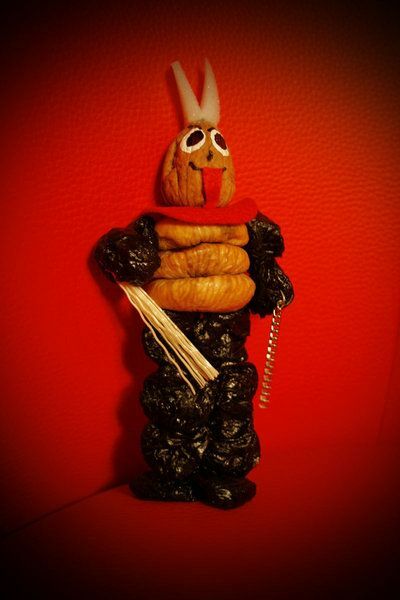 “Be Good!” could be the motto for December 5, which is traditionally Krampus Day in Austria. The day is also celebrated in other Alpine regions such as Bavaria and South Tyrol. Krampus is a beast-like demonic creature and the “side-kick” of Saint Nikolaus; Krampus punishes the naughty children while St. Nikolaus rewards the good ones. Krampusse are furry, have horns and a lolling tongue, and carry a bundle of birch branches to swat the kids. For small children, Krampusse [German plural form of the term Krampus] are truly frightening; for teenagers, they are a challenge to dare each other and show their bravery. As soon as it is dark out, which is usually mid-afternoon in early December in Austria, the Krampusse take over the streets. They run in packs through the streets for hours and are trying to chase anyone, but especially kids and young women. When I was in elementary school, I hated the day and did not want to leave the house when it was getting close to darkness. From the safety of the inside of a locked car or form inside a house, I would watch the Krampusse run through the streets. I could hear the sound of chains and large bells that the Krampusse carry before I could even see them. Later as a teenager, I would walk into town on purpose with friends to dare each other to get as close as possible to one of the Krampusse and then run away quickly without being swatted with the birch branches by a Krampus. The fear was much worse than the pain from the branches since we were wearing layers of clothes and thick winter coats because of the cold. 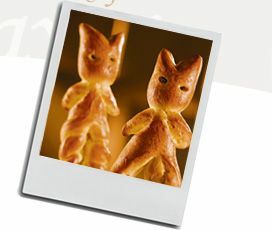 Krampus Day also means special treats such as Zwetschgenkrampus, a Krampus made out of prunes (which is a lot tastier than it sounds), and Semmelkrampus, a sweet bread shaped like a Krampus. For one day, demons rule the streets in Austria. Today, November 30, is the first Advent Sunday, which marks the beginning of Christmas season in Austria. Advent comes from the Latin word adventus, which means arrival. There are four Advent Sundays until Christmas Eve, and these special days are symbolized by the four candles on the Advent wreath. On the first Sunday, one candle is lit; on the second Sunday, the first and a second candle are lit, and so on. Usually, the family sits together and sings Christmas carols and eats Christmas cookies. The wreath is usually made out of evergreen branches and does have real candles, and yes, in contrast to the attitudes in the U.S. Austrians are not freaked out that the wreath will go up in flames even though it will be dry after four weeks of use (side note: we do watch the open flame). The wreath is either placed on a table or hung from the ceiling. Even stores and banks will have Advent wreaths and large Advent wreaths are often hung from the ceiling in churches or streetlights at town squares. I do keep up with the tradition but I have given up on finding a fresh wreath and trying to set the candles in it; Austrian shops offer special metal spikes that safely secure candles to the wreath, but it always seems too much hassle for me here. So I bought a wreath out of metal and I just place candles on it each year – no need to find a fresh wreath or fight with the candles. Most visitors to my house throughout December do find it odd though that we light only one or two candles or that some of the candles are so much shorter from use than the other ones. 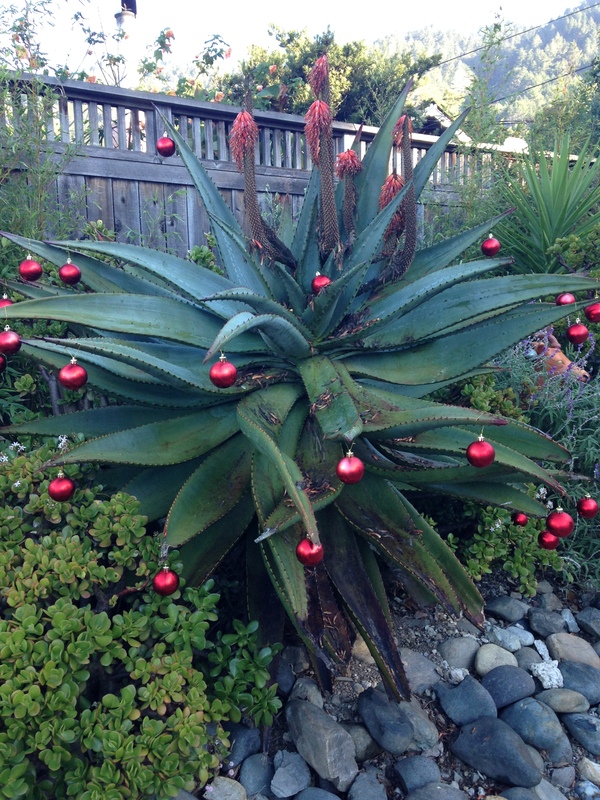 Advent wreaths are definitely not that popular in California. 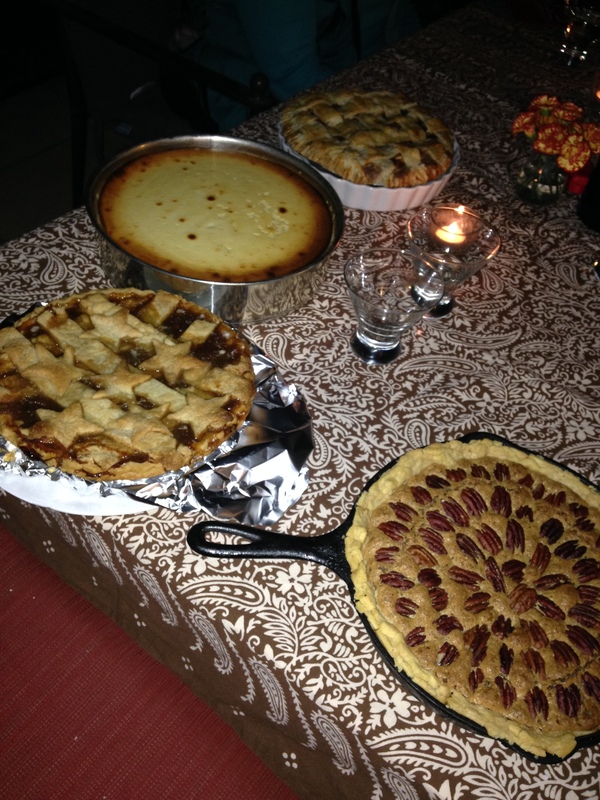 Thanksgiving is one of most typical American holidays that do not exist in the traditional American form in Austria. I enjoy Thanksgiving – but who would not enjoy a holiday that appears to be mostly focused around food, and a lot of it. 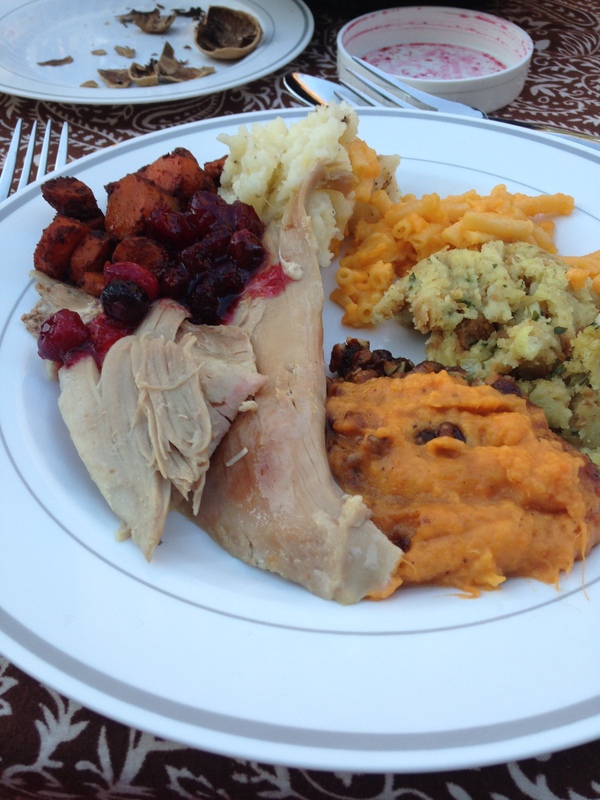 It seems a large part of the tradition for this holiday is to eat as much food as possible in one sitting or day. Of course the holiday centers around the theme of gratitude and giving thanks and this does play its role. Every Thanksgiving scene in an American movie or sitcom seems to include the obligatory part where the characters sit at the table and mention what they are grateful for. And I am sure this scene does happen at some Thanksgiving parties in reality as well. Other less known traditions that I have learned over the last few years of celebrating Thanksgiving in California are that Thanksgiving includes a game of flag football, plenty of football on T.V., a large parade in New York City but shown on T.V., a wide variety of pies, turkey decorations, and ingenious ways to use leftover turkey meat in sandwiches over the next few days following Thanksgiving. 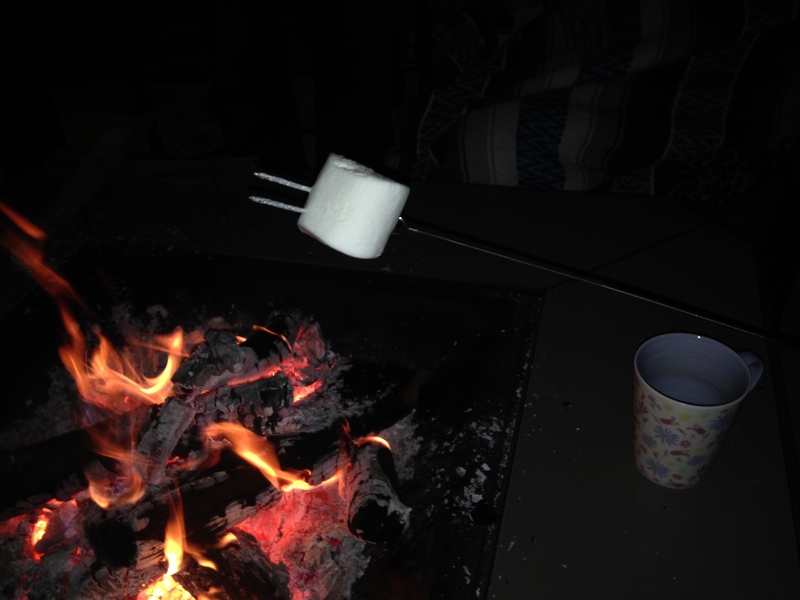 In California, for me Thanksgiving also means eating outside and ending the evening with s’mores over the open fire. I would never associate Thanksgiving with snow since I have never celebrated the holiday anywhere else than Northern California and so far the weather has always cooperated each year with sunshine and warm weather since I moved here. 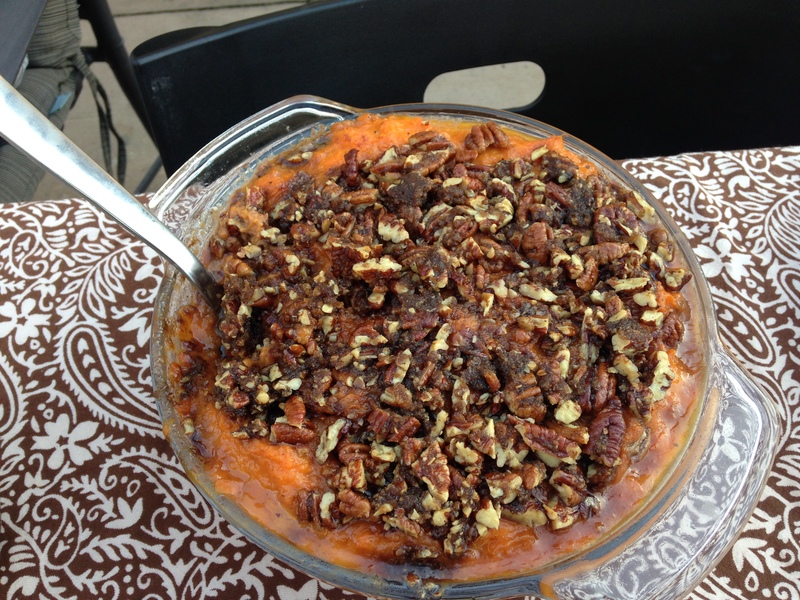 My friend and her husband are always gracious Thanksgiving hosts that would make Martha Stewart feel inadequate with their effort put into the feast. I am not allowed to bring any food or drinks but always leave with leftovers – the best kind of invitation. 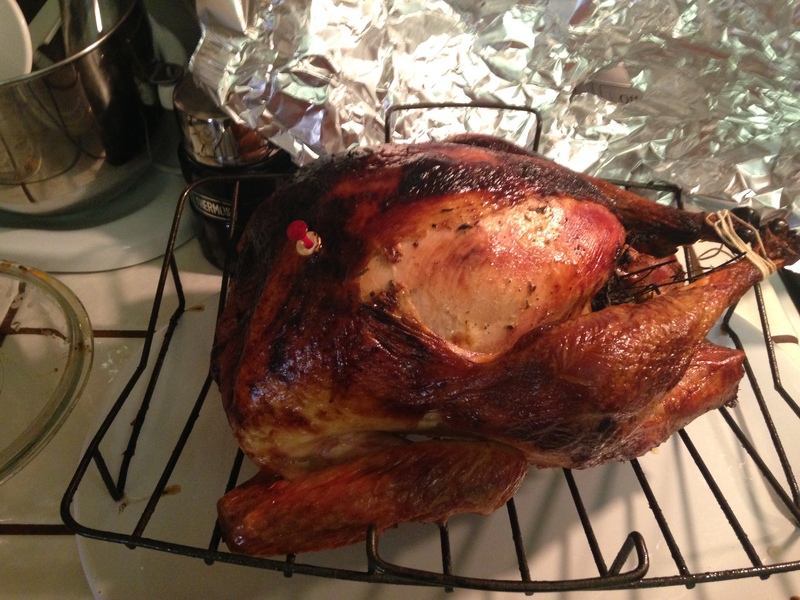 They barbeque the turkey, serve every traditional Thanksgiving side dish that I have ever read about online or in a cooking magazine, and bake several pies and cakes. It is always the perfect meal to eat every typical American food dish that I have heard about in movies. 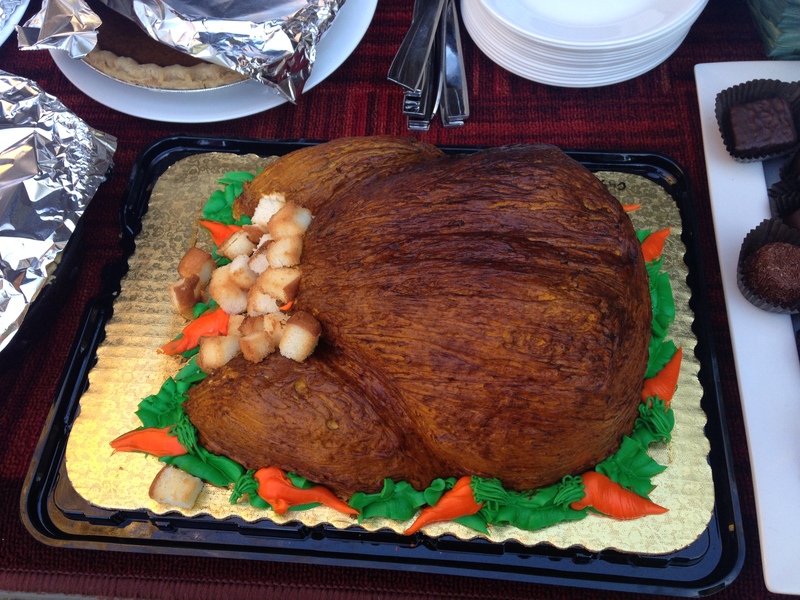 This year also included a cake shaped like a turkey with frosting giving the cake turkey the perfect color and texture. And the evening ended with hot chocolate with a kick (scotch) and s’mores. After Independence Day with its over-the-top firework shows, Thanksgiving is definitely my favorite U.S. holiday. Considering that Austrians love their food and drinks, I am surprised that we do not have a holiday that is more focused on food.